Somewhat garish interior, comfortable enough though and the service was spot on. No ales, so the black stuff had to be drunk. Worth a look! 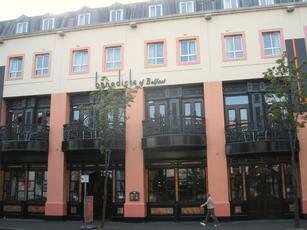 A large, well appointed bar close to the centre of Belfast, Benedicts appears very well run. Prices are not cheap but it's a hotel bar! As a regular visitor from London, I like the huge circular central bar with myriad seating areas all the way round. Service is prompt, professional and friendly. Benedicts has an unobtrusive soundtrack playing in the background most of the time. In the evenings the sound volume is turned up to make Benedicts a bar with a buzz. It has excellent live DJs on Friday and Saturday nights, who blast out current pop and dance tracks until 1 am. The joint really does rock. As an occasional visitor, I haven't found any of the regulars give me any hassle. There are no posers here. It's an unpretentious working class bar with a great formula for success, as described above. It works. I like it. Decorative in a contrived sort of way with loads of intricately carved wood furnishings. Very overprice and a little pretentious. Open until 1am most days.